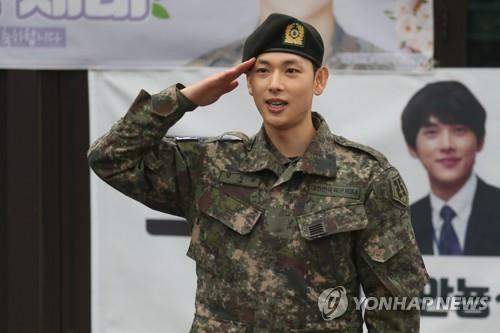 Actor Im Si-wan was discharged from the Army on Wednesday as the 30-year-old completed his mandatory military service, setting him up for his return to show business. Im made his first official public appearance in 21 months in a discharge ceremony held at a boot camp in Yangju, Gyeonggi Province. He has been serving in the Army special forces since joining the Army in July 2017. With a big smile, he gave his final military salute to fans and journalists who gathered together at the scene to welcome him back. “I still can’t believe (I was discharged). Maybe I will after getting up late in my own bed without the morning bugle tomorrow morning,” Im told reporters and fans. About 100 fans from as far as Japan and China, as well as South Korea, came out to the military camp to celebrate his discharge. “I thank (my fans) for waiting for me. I also had chances to talk to (senior actor) Seol Kyung-gu a lot and get help while on leave during my military service. With so many things to be thankful of, I will work harder,” he said. His first project after the military discharge is “Strangers from Hell,” a webtoon-based thriller by cable channel OCN. He has been cast in the lead role as a young man who moves to Seoul to find a job but finds himself in the company of very strange neighbors. The series will hit the small screen in the second half of the year.